« Look, Ma — No Noise Floor! 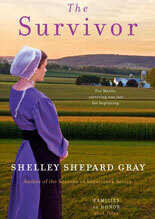 This series was my first exposure to the Amish sub-genre of the Christian sub-genre of the Romance genre, and I really didn’t know what to expect. Chase scenes in buggies? Chaste scenes in cornfields? Or something grittier, maybe, fulfilling the popular epithet of “bonnet-ripper”? What I found was: yes, yes, and, well, sort of. Climaxes (dramatic and romantic, never sexual) often do take place in buggies — as, I suppose, they do in real Amish life. (I mean, where else can you get your rival alone, have a heart-to-heart with your mother, or propose in private to your sweetheart?) There are flower-filled meadows, berry-filled woods, bucolic farmhouses redolent with the smell of fresh bread. There are also tender love stories and trials of faith. What surprised me about Gray’s romances, though, was that smack in the midst of these idylls are quiet sub-plots about cancer, domestic abuse, and bullying. Gray gives these elements a very light touch, but they’re there. As a reader (yes, we do read books before we narrate them!) I liked this dimension. And as a narrator, I enjoyed the challenge of finding a dramatic interpretation that preserved the gentle sweetness of the story but didn’t oversimplify it. Interesting post on an interesting sub genre I never knew existed! !